It is very, very easy to train or coach your own robot. The way is to teach your robot in a question-answer fashion. 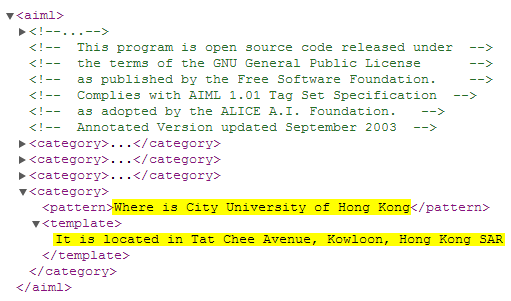 Q: Where is City University of Hong Kong? A: It is located in Tat Chee Avenue, Kowloon, Hong Kong SAR. By asking your robot to memorize this Q-A pair, your robot gets smarter. And when you ask the question, it will simply output your given answer! So if you add a test.aiml file and edit above pattern-template category, you have finished training your robot to learn this! That is it! Believe it or not, it simply works! 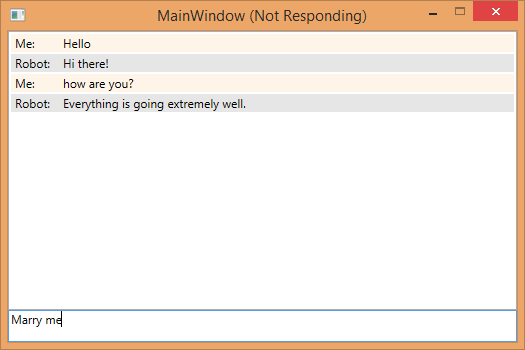 Get started with AIML C# programming (III): Be nice and understand that robot can be naïve! In previous two blogs (Here and Here), I have shown how to experiment AIML programming, and it is not hard to turn the HelloRobot console into a GUI program. Yes, I did, and found that the robot is smart and fun. The Robot: I am Unknown. In this series of articles, I am about to keep a note on my recent trials to program AIML using C#. AIML, or Artificial Intelligence Markup Language, is an XML dialect for creating natural language software agents. With AIML, you can design your own soft robot with ease! Create a library project and add a class called CuteRobot. 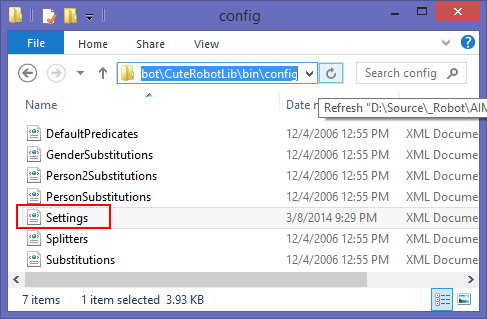 The reason for create a library is to reuse such robot code later. You may however directly put it in the main application as you like.